BALTIMORE (WJZ) — Baltimore is being recognized for its dedication to community service, and has recently been named the number one city for producing Americorps members. The Civic Works Real Food Farm is located in northern Baltimore on Perlman Place above North Avenue. “The community members, like, they love the gathering areas they feel like they have a place they can come together and do positive things,” Ninaly Arzu, AmeriCorps member, said. A vacant lot is transformed into a green space by Americorps members dedicated to beautifying the city. “Most importantly they are the implementers, they are the doers, they are the ones who help grow the produce here and transform our lots, or install energy efficiency devices,” Dana Stein, Civic Works executive director said. Civic Works AmeriCorps members, volunteers and staff focus on community improvement. Since it was formed in Baltimore 25 years ago, thousands of volunteers have invested millions of hours of service. 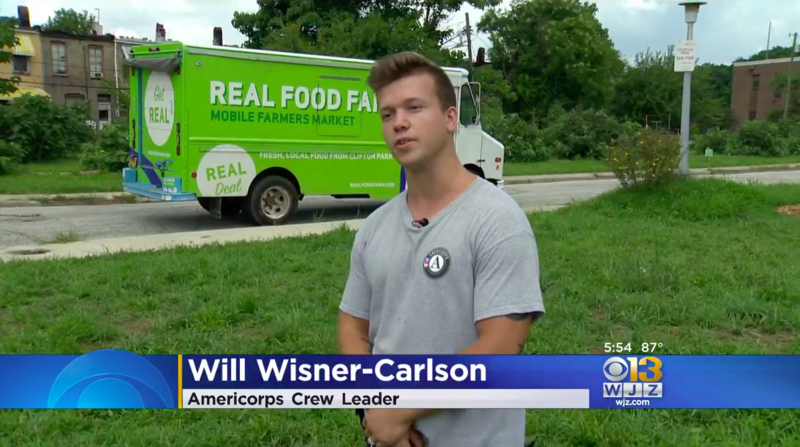 “I really think having more people come out and volunteer and sort of becoming more engaged in places in the community they wouldn’t normally come can be highly beneficial,” Will Wisner-Carlson, AmeriCorps crew leader, said. Baltimore is being honored for producing the most AmeriCorps members. The program operates in cities across the country. “We think that says a lot about the young people in Baltimore, their enthusiasm, their desire to make a difference and make a change,” Stein said. The green spaces also offer community members a place to garden, relax and connect. “Certain things for the children to do, for example, we have stones they can paint, put their names on, or put up on the wall or up on the gate so when they walk in they have ownership,” Arzu said. Since 1993, Civic Works has transformed 250 vacant lots into gardens. Story by Tracey Leong of WJZ. Read the article and watch the video online at baltimore.cbslocal.com. Join the 25 Days of Impact Challenge!